Does the KTM 125 Duke feel capable enough in real world conditions? And is the Indian market ready for such a premium 125cc motorcycle? KTM revolutionised the budget performance segment when it launched the 200 Duke back in 2012. I remember my college parking lot, which used to be full of R15s, turning all orange! The Duke’s looks, coupled with sprightly dynamics and explosive power was a perfect recipe for disruptive dominance in the market. But the icing on the cake was its price tag of Rs 1.17 lakh (ex-showroom Delhi). Seven years later, KTM launched the new 125 Duke, for around the same price it had launched the 200 Duke at. While it did prove to be quite fun on the Bajaj test track during our first ride, it got us wondering, if it could actually work out on the streets? Whether it would fill the gap left behind by the now much more expensive 200? And finally, is there actually a market for premium 125s in India? It looks exactly like the KTM 200 Duke minus the sticker work. Though the international-spec 125 Duke comes with the new 390 Duke-like styling, India gets the old-school KTM design. It isn’t necessarily a bad thing as the 200 Duke is quite popular in the country and its design is instantly recognisable to the aam junta as the quintessential KTM. It is also a sound business decision as using the older bodywork saves the brand a lot of money, and also helps in pricing the bike reasonably. After all, this bike is intended for someone who wants a KTM on a budget. The instrument cluster is also shared with the 200 Duke. The orange backlit digital console is quite informative and shows the fuel efficiency, range, fuel consumption, trip readouts, gear position, revs, speed, time, odometer readout, coolant temperature, fuel gauge and whatnot. However, it feels a bit cluttered considering that small square-ish space, and the tachometer reading, with its tiny numbers in particular, takes some time to learn how to read. The switchgear, handlebar and the key-slot are all premium, and KTM hasn’t cut corners on any of these. The key is laser-cut for better security - it is relatively difficult to duplicate compared to conventional keys. Though the rearview mirrors look sporty, they could’ve been larger, or more outboard, for better visibility and smaller blind spot area. Overall, the build quality of the motorcycle is on par with other KTM bikes, so there’s nothing to complain about here. The 124.7cc single-cylinder DOHC engine is liquid-cooled and generates 14.5PS at 9250rpm and 12Nm at 8000rpm. These numbers are pretty decent for a performance 125, but the powerband is quite narrow. It is concentrated mostly between 6000-8000rpm. So, in order to maintain the momentum, you’ll have to keep the engine constantly on the boil. Consequently, it ran a tad hotter than normal, as I noticed that in traffic, the coolant temperature bar was just below the overheating threshold level. And I wasn’t even gunning it. Being a 125, there’s only so much power you can extract, and it lacks the outright frantic nature that KTMs are known for. The sixth gear is tall, but there’s just no power if you need to quickly accelerate, demanding a couple of downshifts to get the engine back into the powerband. When it comes to the transmission quality, the gear shifting action is slick and slots in nicely with a click. At 60kmph in 6th gear, the tacho hovers just above the 5000rpm mark, while 100kmph arrives a bit over 8000rpm. It takes its own time to crack the ton as the powerband fizzles out post 90kmph. That said, newer riders will find the motor unintimidating. And that’s the whole point of this motorcycle - to be beginner-friendly! That said, fourth gear is short enough for the motor to feel really tractable at city speeds, with the baby Duke pulling comfortably right from 25 to 65kmph. 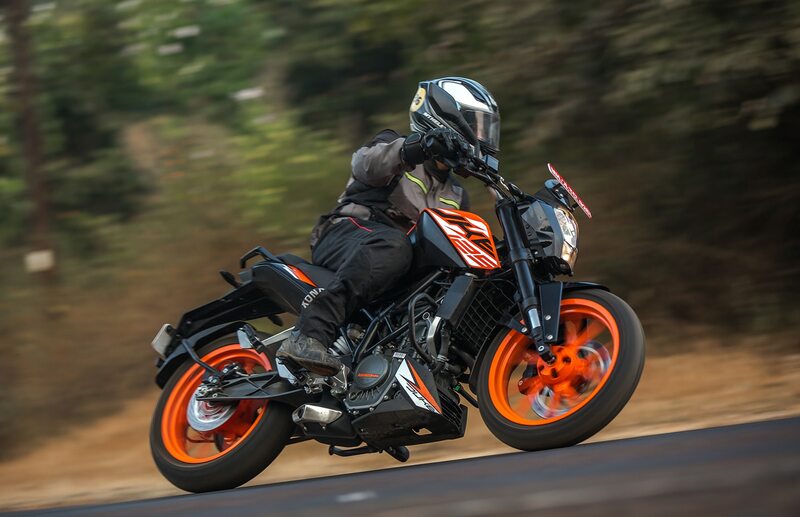 In our performance tests, the KTM 125 Duke reached 60kmph from standstill in 5.65 seconds, just 0.4 seconds quicker than the Honda CB Unicorn 160 - amongst the slowest 150cc motorcycles we’ve tested. Performance wise, while it does beat 125cc motorcycles, it’s still slower than almost all 150-160cc bikes. It takes 17.25 seconds in the run up to 100kmph, which is fairly reasonable, but then again, it can’t keep up with the likes of the Suzuki Gixxer, Honda CB Hornet 160R and TVS Apache RTR 160 4V. The motorcycle reached a top-speed of 106.54kmph - a little over 3kmph more than the Honda CB Shine SP, which is not saying much. If you’re expecting KTM level of performance, then you need to look elsewhere. But then did it at least manage to deliver in terms of efficiency? Well, it does manage to compensate to a certain degree here. In our tests, it returned 46.92kmpl in the city and 48.05kmpl on the highway. If you’re touring on this motorcycle, you can comfortably cover about 450km on a tank full. One aspect where this baby Duke really shines is the refinement level, which is by far the best among KTM’s current lineup in India. The engine feels smooth both in the city and on the highway, and this makes for a fatigue-free ride. The riding position is a little sporty. You’re sitting on a compact seat, with your legs folded rearwards (because of the rear-set footpegs) and your torso has a slightly leaned forward stance. The whole setup eggs you to push your cornering skills to its limits. While it might not have brute power, the bike’s a brilliant handler. It’s easy to change directions on the move, thanks to the wide handlebar. It also allows to tip into corners easily. The suspension setup (WP inverted forks and rear monoshock) is slightly on the stiffer side, but there won’t be any back-breaking problems on most of our roads. Only on really bad surfaces is it actually jarring. The only grouse I had was the wider-than-normal turning radius, thanks to the rather fat 43mm inverted forks. The tyres are also really good as they provide great grip on corners. Now, the MRF RevZ rubber used in this bike is the same as the one in the 200 Duke, so we’re sure its grip levels on wet roads will be great too. KTM hasn’t cheaped-out on the brakes either. You get a proper 300mm front disc reined by a radial caliper and a 230mm rear disc. As expected, the stopping power is superb, but I wish it had a wee bit more progression, especially at the front. You also have the safety of a single-channel ABS in case things get hairy. Interestingly, the braking distance from 80kmph to zero is 38.82m, which is actually longer compared to other 125cc bikes. Even from 60kmph, it takes a somewhat long 20.62m to come to a standstill. These figures put it at par with 160cc motorcycles, such as the Gixxer, Hornet and the Pulsar NS160. This is because at 148kg, this KTM is in the same weight class as the 150s and 160s, not the lighter 125s. And then, the intervention from the single-channel ABS is also to be blamed for increasing braking distances a little bit. All these underpinnings have been designed for a 45-horsepower motorcycle. So on the 125, these components seem to be so far ahead of the motor’s performance, that there’s very little you can do to get into trouble. Exploiting the full handling prowess of this bike is actually very easy. All in all, the 125 Duke is a promising motorcycle with satisfyingly agile dynamics. It offers the simple joys of motorcycling - just like how you felt when riding a bike for the first time. But then you reach the limits of this bike fairly quickly and might just end up craving for more. At Rs 1.18 lakh (ex-showroom Delhi), it is also quite expensive for a 125cc motorcycle. However, if you’re a KTM fan looking to experience the premium-ness of the Brand Orange at a budget (somewhat), the 125 Duke is the one for you. And that’s who the core audience also is. Moreover, it shows in the sales numbers that there are quite a few of those too - a healthy 2,414 units sold in the first month since launch! Looks like there really is a space in the Indian market for a performance 125.